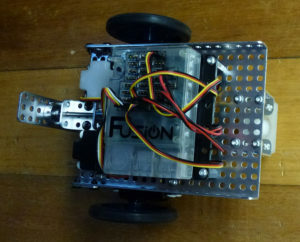 Back view of Fusion robot. In this tutorial we will look at using the simplest possible Blockly program to move your Robot forwards, and then stop. We will then compare this Blockly program with the automatically generated Python equivalent to this Blockly program, and show how to run Python separately using Fusion’s Python Editor. It is assumed that a Wi-Fi link between your computer and your Fusion robot has already been set up, and that you have set up User and Admin accounts within your Fusion Robot (if you have not completed these items, look at our previous tutorial). In the video below we start up a browser (theoretically any browser, but Modern Robotics recommend Google Chrome, so that is what we will use). To control our Fusion Robot, we can send commands to it in the computer languages Blockly and Python. Blockly is excellent if students have not used computers & robots before. It can be used in introductory courses in Schools from lower middle school levels and above. Python is an excellent computer language for more advanced work, and is appropriate for upper middle school students and above. If you are interested in more detailed information about Python, try clicking here. After running the video above, go to the next tutorial to see how to use more powerful Python commands.